An 18 year old man breaks his leg while out in the surf. Meanwhile, Maxi uses a mobile phone tracking device to locate a thief. 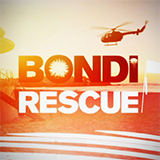 Bondi Rescue was broadcast on Ten at Wednesday 7 November 2018, 19:54.